Suffering from blurred vision? Unable to read smaller prints? Having a tough time seeing in dimly lit rooms? 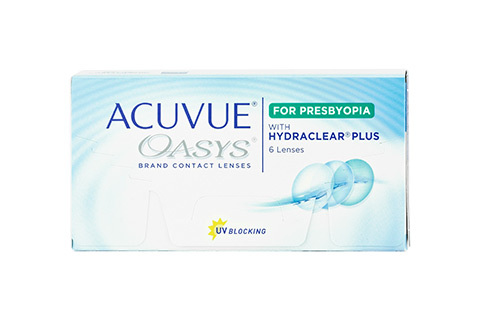 Then, Acuvue Oasys for Presbyopiamight be the perfect solution for you! These next generation multifocal contact lenses from the hugely popular Acuvue Brand, the makers of the world's first disposable soft contact lenses, promises amazing comfort and unmatched visual clarity even in different lighting conditions. With unique patented technologies like Stereo Precision and Hydraclear Plus, Acuvue Oasys for Presbyopia contact lenses ensure you experience crystal clear vision, be it near, far or in-between. Hence, this extraordinaryproduct is recommended for a range of everyday activities including reading, computer viewing, sewing, driving and playing. If you are unsure whether Acuvue Oasys for Presbyopia is right for you, simply talk to our online opticiansat Mister Spex, and buy the most appropriate contact lenses, with their expert guidance.